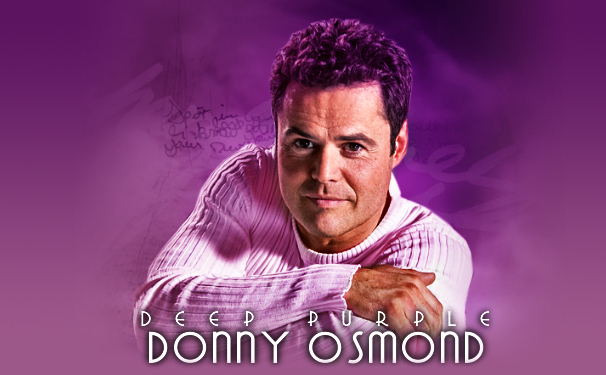 Welcome to 'Deep Purple', the TFL.org approved fanlisting for the singer, actor, and former teen idol Donny Osmond. Donny is best known for being half of the brother-sister singing duet Donny & Marie. In the 1980s and early '90s, Donny re-invented himself as a solo vocal artist with the hit "Soldier of Love". He went on to a long broadway stint as Joseph in Andrew Lloyd Webbers 'Joseph and the Amazing Technicolor Dreamcoat'. Currently, Donny & Marie have reunited in Las Vegas at the MGM Grand for a a 90-minute variety show, which has been renewed to run until October of 2012. In 2009, Donny won Dancing With The Stars' coveted mirror ball trophy. and a growth rate: 0 fans/day. It is owned by Chrisie. We're listed at TFL.org.